This is an October 1928 Vintage World's Work Magazine which is in good condition with slight wear to the covers but the pages are very clean. This World's Work Magazine is suitable for framing and measures approx. 6 3/4" x 9 1/2". 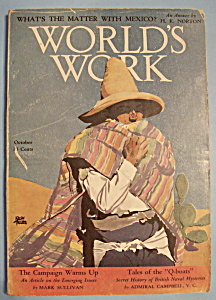 This World's Work Magazine cover features "What's The Matter With Mexico?"